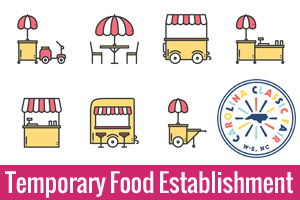 In the state of North Carolina, foodservice establishments such as restaurants, take-out or delivery food businesses, school cafeterias and institutions (hospital, nursing home, etc.) are to be inspected at a frequency that is determined by the complexity of the menu and the susceptibility of the population served. There are four risk categories with a corresponding inspection frequency. Risk Category I establishments are inspected once per year, do not serve potentially hazardous foods and are most often bars or coffee shops that use reusable cups or drinking glasses. Risk Category II establishments are inspected twice per year, have limited menus with simple food preparation procedures and are primarily cook and serve type establishments. Risk Category III establishments are inspected three times per year, have a more complex menu and cook some foods in advance, then refrigerate the foods to be reheated and served at a later time. Risk Category IV establishments are inspected four times per year, have the most complex menus that involve cooking, cooling and reheating of several foods or they serve a highly susceptible population such as children, elderly persons or those who may be immunocompromised. The unannounced inspections are made by environmental health specialists employed by the local county health department. Using a standardized inspection form, the specialist marks the violations and determines if the full point value or half of the point value will be deducted. Factors that influence a decision to deduct the full point value is the severity of the violation or if it has been deducted on previous inspections. If there is a potential for a violation or the violation is minor, the specialist may make a general comment, to remind the operator to keep the condition under control or take preventive steps to keep the condition from progressing to a violation. To arrive at a numeric score and letter grade for the inspection, the total points assigned to the violations are deducted from 100 to give a percentage score. A two point education credit may be added to the percentage score, if there is a full time employee who has successfully completed an approved food safety training class. The letter grades are determined by the numeric score and are based on a 10 point scale. Facilities with an “A” have a score between 90.0 and 102.0, “B” grades have a score between 80.0 and 89.5 and “C” grades have a score between 70.0 and 79.5. If the score without the 2 point education credit is less than 70.0%, the permit is revoked and the establishment is closed. Re-inspections are made for facilities with a letter grade less than “A”. When a grade less than “A” is posted, the operator of the facility may request a re-inspection after the violations noted on the inspection have been corrected. A re-inspection must be completed within 15 days if the request for re-inspection is for the purpose of raising the letter grade.